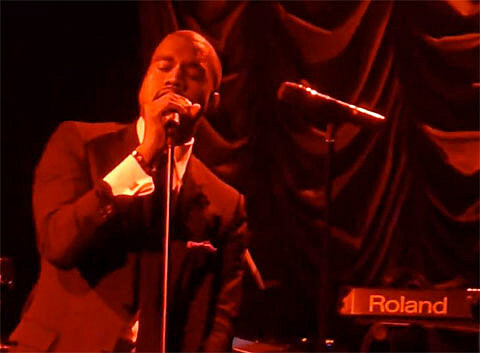 The fully-suited Mr. West crooned through favorites like “Homecoming”, “Flashing Lights”, “Heard ‘Em Say”, “Love Lockdown”, “Power,” “Good Life”, and “Can’t Tell Me Nothing” and even ventured into new territory like “Moma’s Boyfriend”, an unheard Billy-Joel’s-“Moving Out”-sampling track viewable in the video below. Besides John Legend, who contributed with his hit “Ordinary People”, Estelle was in the house (and joined him for a rendition of “American Boy”) as well as A-Trak, Consequence, and his “latest signing to G.O.O.D. Music” Pusha T (of Clipse).